The first signs of spring are starting to show this week – buds on tree branches, Canadian geese migrating home, squirrels bouncing about, and birds chirping delightfully among the tree tops. It really is a beautiful thing to witness. One stroll through the park and it’s clear that this renewal we feel during spring is common to all walks of life. I just want to soak it all in. On Sunday, we spotted thousands of geese migrating home, all in various v-shape formations across the sky. It was so fascinating to watch, I headed home and read up about Canadian geese online. I must say, they are pretty cool birds (even if I do have to dodge all their poop on walks). Not only do they typically mate for life, but they also tend to come back to the same area every year. Romantic and directionally savvy? Those females have it made! I’m finally craving salads after a long stretch without giving them much room in my diet over the winter. I just don’t crave salads in the winter no matter how hard I try. My body is now looking for fresh, lighter foods in hopes that the weather will follow suit. This week, it seems to be working…but I won’t hold my breath. We all know how quickly that can change! This salad is a nice compromise for early spring; it’s not too summery or light, but warm and hearty while still refreshing. 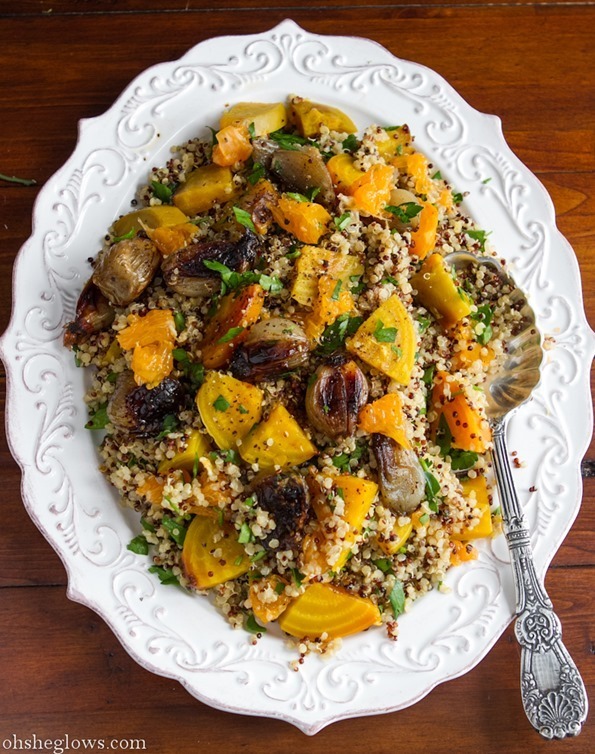 I combined roasted golden beets and caramelized shallots with warm quinoa, fresh parsley, and juicy orange segments all topped with an orange miso dressing. The steps for this recipe are fiddly and there is a long roasting time, but if you find yourself with a lazy weekend morning, it really is a nice salad to pull together for lunch. I recently started to play around with a new type of miso – Chickpea miso. Oh, it’s good…real good. I’m avoiding soy right now as I try to figure out my recent allergic reaction and chickpea miso is a great alternative (I hear they also make a chickpea tamari too!). This one is pleasant and lightly sweet much like soybean light/white miso varieties. I couldn’t find it anywhere nearby so I ordered it online via Upaya Naturals. Of course, feel free to substitute your favourite miso in this dressing or if you don’t have miso why not play around with making an orange vinaigrette? 1. Preheat oven to 375F and line a dutch oven or heavy-bottomed pot with a piece of parchment paper. 2. Trim beet greens, leaving 2-3 inches of the stem on the beet (this prevents the beet from drying out while roasting). Note: If you buy loose beets without stems this is fine too. Use what you can find. Reserve beet greens for sautéing, if desired. Wash beets, but do not peel them. 3. Place beets inside the pot. Drizzle on olive oil and sprinkle with salt and pepper. Roll around the beets to coat. 4. Soak shallots in a bowl of water for a few minutes. This helps to loosen the skin. Slice both ends off the shallots and then peel all the skin off each. Place a piece of tin foil on the counter (about 1 square foot) and place the shallots on top. Drizzle with olive oil and sprinkle with sea salt and pepper. Rub the shallots to combine. 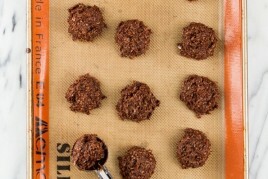 Gather the tin foil at each side and crinkle it upward to seal the top. Place shallots in the pot along with the beets. 5. Place lid on pot and roast beets and shallots for about 1 hour at 375F. 6. Meanwhile, cook the quinoa. Rinse the quinoa in a fine-mesh strainer and place it into a pot along with 1.5 cups of vegetable broth. Bring to a low boil, reduce heat to low-medium, and cover with tight fitting lid. Simmer for 17-20 minutes covered, or until all the water is absorbed. Remove from heat and let stand for 5 minutes. Fluff with fork. 7. Prepare the dressing by processing together all the dressing ingredients. I like to use a mini processor for my dressings because the clean-up is minimal. You could also whisk everything together by hand too. 8. After 1 hour, remove pot from the oven to check on things. Remove the shallots and set aside on the counter (keep the tin foil on so they stay warm). Carefully, prick the largest beet with a fork. If it slides easily through, it’s ready. If your fork feels resistance, it needs more time in the oven. I had to cook my beets for about 1 hour and 25 minutes, so don’t be alarmed if it takes you more time. 9. Remove beets from oven, remove lid, and allow beets to cool until they can be handled. Trim both ends of the beet and discard. Run water over beets and peel the skin off with your fingers (the skin should slide off fairly easily) and then slice beets into bite-sized pieces for the salad. 10. To assemble the salad: Toss together the cooked quinoa, chopped parsley, Herbamare or sea salt, and a couple tablespoons of the dressing. Gently fold in the shallots, segmented oranges, and beets. Drizzle on the rest of the dressing, sprinkle on pistachios (optional), and serve immediately. Note: For how to segment an orange, see this You Tube demo. You have outdone yourself again! I can’t wait to make this! Wow! So gorgeous and unique. 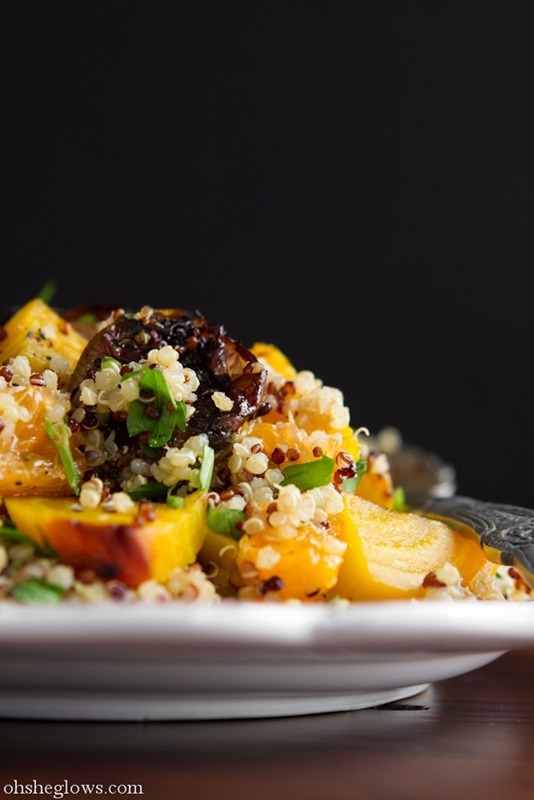 Golden beets, rainbow quinoa, chikpea miso…so many new foods to consider! Truly goes to show how vegan food is so far from boring! Wow! I’m not a fiddly recipe type girl so I’ll just enjoy the eye candy. Looks amazing though! I’ve been craving salads a lot lately too! And I just happened to pick up some beets at the store a few days ago. I’ve never heard of chickpea miso, but I’m sure it’s wonderful. I’ll have to try to get my hands on some! I would TOTALLY come hang out for a week or so, you could mentor all these young blossoming chefs, get a bunch of extra help and hands out of it, and we’d all get some great eats. This looks amazing! And I love that it’s a warm salad- I’m with you in that I never want salads during the winter time. This I feel I could eat year round. Definitely adding to my list of things to make! Chickpea miso?! Sounds amazing! & gimme beets and quinoa any day!! Yum! This looks great, Angela! I make salads like this with whatever I have handy all the time, but I love getting new ideas of flavors that will go well together. You rock!! This sounds so, so, delicious! I had roasted beets for the first time the other day and was pleasantly surprised. They’re a far cry from the (gag) pickled beets of my childhood! ohhh pickled beets….same memories! I wonder what I’d think of them now though. I loathed pickled beets growing up. But I moved to Australia, and they put ‘beetroot’ on everything that’s sandwhich or burger. It’s amazing. A yummy slice of beetroot makes a sandwhich…promise! Yum! I recently discovered golden beets and love that they don’t bleed all over like the red beets do. Quinoa is a favorite for me as well. I have some miso that has been sitting in my cupboards, may have to break it out for this Spring salad! I bought a big bunch of beets without knowing what I wanted to do with them — I think I just figured it out! This salad sounds perfect for the weather we have in Michigan right now. Gorgeous! Love the white platter, too. I just bought my first container or miso and am excited to start using it. I didn’t realize the chickpea miso didn’t contain soy! I’ll definitely be trying that out next. Hope you get to the bottom of your allergy/food issue! I had no idea chickpea miso even existed. I’m avoiding soy, so this is perfect! That Orange Miso sounds wonderful and love the serving bowl. Pretty sure it looks to be Anthro? I have a big platter that I think is from the same line! 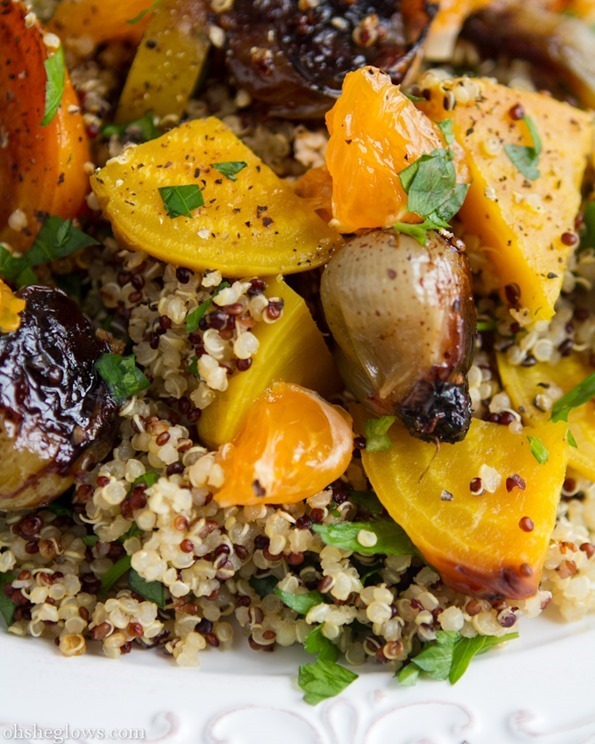 Perfect salad to ring in spring…I love golden beets, too! This looks divine! I’ve been meaning to buy some miso but last time I was at Whole Foods they didn’t have the kind I wanted. I love the golden betters for spring! It needs to be spring. Now. I can’t cope with much more of this cold. Just a little bit longer until we’re in Portland, where it better be warm! All I’m sayin’. WOW! This salad looks mouthwatering delicious!! I’m definitely gonna make this one and take it with me in the office for lunch! Many thanks for sharing!! You are amazing – I make something of yours at least 2 times a week. Thank you Eric, so happy to hear that! I have a question about body acceptance, not dieting, and eating healthy. Within the past 2 months, I’ve been making a slow transition from dieting and hating my body to body acceptance. I have reached a point where I want to love my body at any size, stop dieting, and accept my “happy” weight. I started reading “When Women Stop Hating Their Bodies” and it’s really helped me so far. The problem I’m having is, recently I began the transition to a vegan lifestyle and I’m worried that it will turn into another diet in disguise. I’m lactose intolerant, so when I cut out dairy I started feeling immensely better. I stopped eating meat because of the animal cruelty. I love the idea that we can survive without having kill animals. My desire is just to feel good after eating. I’ve been so used to feeling like crap after eating, that when I went vegan and started feeling much better, I got addicted to that feeling (I should also mention that when I first went vegan, I stayed away from wheat breads without even meaning to because I was avoiding eggs and dairy). I also wonder if I might have a wheat intolerance or not. Plus, I want to avoid soy as well since the jury is still out on if its good for you. Anyway, the point is, I’m really trying to love my body and accept it at any weight. Do you have any guidelines on how to eat healthy without letting it become about weight? How you keep it being about loving yourself and your body? I know I want to have dessert & other indulgences, but still treat my body as well as I can in regards to eating (aka eating desserts that are as healthy as possible, etc). Can you share your thoughts or any advice on this topic? [ Smiles ] This is a nice one, Angela. Beets are on my “to try” list this year. I have been skeered for too long, I tell you! Oh man this looks amazing and such gorgeous colors! I need to get some of that chickpea miso into my life asap, I have walked by it too many times at the store. Next trip. Thanks for another great recipe. I love all of the flavor combinations in this dish!! I’ve never tried golden beets, but I’ve been obsessed with purple beets lately! I’m curious about the chickpea miso! This salad looks absolutely delish! Do you think I can use purple beets instead? Unfortunately, I havent been able to find the golden kind anywhere near NY. I live in Costa Rica and have never seen these golden beets, will definitely try to find them! I am loving this healthy salad. I wish you were my personal chef! Wow, this looks delightful! 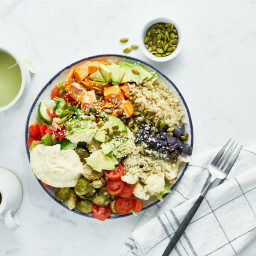 I am a huge fan of warm salads these days, the weather is just not warm enough yet for hugh jass cold salads yet! 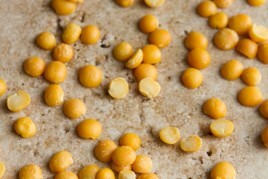 Ohhh, and I’ve seen chickpea miso before but haven’t bought any yet, very intrigued! This sounds SO lovely Ange! I love beets, shallots and miso so this is sounding SO appealing right now! I haven’t seen chickpea miso in any local stores either, but you’ve got me curious now. Like you, my bod is SO ready for spring. Fresh salads and herbs are exactly what I’ve been craving these days! This looks amazing–the orange miso dressing looks like it would be great in other dishes, too! Yum! This dish looks healthy and so tasty. Great idea! I love hearty salads like this. Still light, but fill you up! That miso sound so good and I love that white platter! Your pictures are just beautiful! Hope you get to the bottom of your allergies! This looks great! I have recently discovered quinoa, but I am not very imaginative in how I cook it. I am always on the look out for some inspiration. Thankyou, I am inspired! 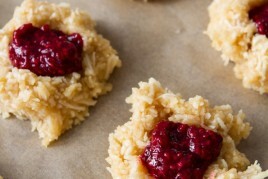 Love this recipe of yours! This is perfect for spring, very colorful, consists of different ingredients, and very healthy of course. By the way, love to try that Chickpea Miso! Thanks for posting this, very lovely! Can’t wait to try it. That salad and that chickpea miso looks fantastic! I think the only soy I have now is in the form of miso or fermented soy sauce, besides that I avoid most soy-containing products. I’ve been toying around with making my own chickpea miso for a while, as I wish I could buy a jar of it here in Australia! Looks absolutely delicious! Beets, of any color, are one of my favorite foods so I’m always looking for new ways to prepare them – and of course new salad ideas! Thanks for taking the time to put together this beautiful post. Hi Angela, I, too know about the soy issue. I went through a time with reactions to certain foods even after I thought I had identified (after a four-year odyssey) and weeded lots of foods, additives, etc. out that were making me feel, well, still not “well”. By happenstance, I stumbled across an article about soy allergies. At first, I didn’t give the idea much credence: “Who’s allergic to that old stand-by, soy?” But the more I read other articles, blog entries, etc., the more I found myself nodding “Yes, yes, that’s me too!” So I cut soy out entirely (even trace amounts). Soy turned out to be the next-to-the-last item I eliminated (the last being casein). And, three years later (and still sixty-five pounds lighter with much better blood pressure, cholesterol, etc. ), “stumbling” into a soy allergy has proven to be a wonderful stroke of kismet. I think we need to, sometimes, question even those practices which lots of folks swear by/attest to if those practices just aren’t making us feel “well”. It’s tough to “go against the grain,” particularly if the grain (bad pun intended, sorry!) is touted by everyone as “a miracle”. Ultimately we have to trust ourselves. They’re our bodies, after all. Keep up the great work friend! I love beets but I don’t think I’ve had golden beets..nor have I had miso..this recipe will be a great way to try both! Absolutely beautiful dish! Happy Friday!!! Chickpea miso?! YUM! This looks so bright and delicious. On a different subject, more in line with your introductions to being vegan posts, could you post something (or maybe you have an I’ve missed it) on cooking seitan? I can make it and its tolerable, but nowhere near as delicious as store bought or restaurant made. Wow. Gorgeous!!! I could live on beets- spring is in the air- er, dish!!! Ooh chickpea miso! That’s a new one for me! I love golden beets. They taste so much more… rich (?) to me? I don’t know what is, but the flavor is so different! Wow! I’ve been looking for a good recipe for a salad with beets. This is perfect! Hoping to make it this weekend! Wooow!!!! Made me hungry :D Looks delicious!!!! Oh my, oh my, oh my! This looks amazing! I want some RIGHT now. I, too, think I am dealing with soy allergies (at least that is what I think my issue is) – so I am happy to see non-soy vegan options. THANKS! What a lovely recipe. I love beets and use them everywhere. 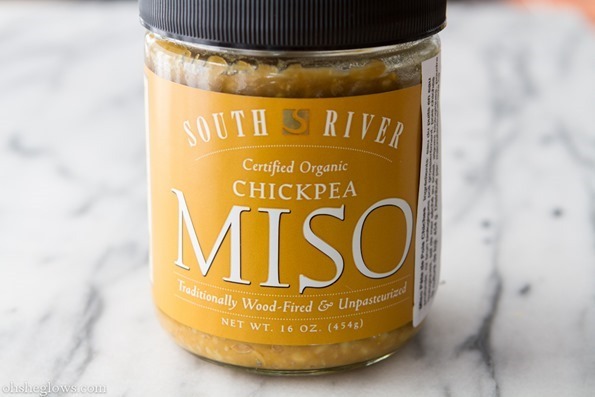 I had not heard of chick pea miso, but it sounds terrific. Great recipe. I just have to say again, thank you thank you thank you! !! I have been a vegetarian for almost 30 years and have been vegan gluten free for the last couple of months. 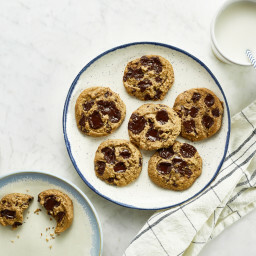 Your knowledge and recipes are absolutely amazing! !! 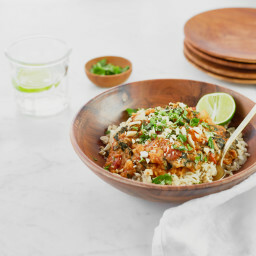 When I’m in the kitchen creating and get stumped or just looking for a new recipe I always say lets go to ohsheglows.com. I have made a lot of your stuff and its always perfect you have amazing taste and talent. Very beautiful, I like all the colours you’ve added to this salad. I have yet to try miso but it’s certainly on my list. Happy Easter! This salad looks just beautiful, especially those gorgeous caramelised shallots. We are just moving into Autumn now here in Australia so I think this transitional salad will suit our season as well! Now I just have to find some of those golden beets!! try avoiding legumes/grains….. crazy I know, but the lectins in grains and legumes, for example wheat germ agglutinin, damage the gut lining and “open the door” for food antigen to escape into the bloodstream. WGA is seen as foreign by the body and initiates an inflammatory response, which could explain your allergies ??? who knows, worth a shot though if the soy, dairy and other eliminated foods don’t seem to be suspect. Great looking recipe Angela. I love golden beets not only because of their unique flavour but because they are so much less messy than the red ones. I like to boil or roast beets and cut them into cubes or sticks for Tyson, and the golden ones mean I don’t have beet-stained hands to deal with afterwards! Oh I have just been looking for beet recipes to try this week. I love your recipes btw! But I purchased red beets. Have you tried this recipe with red beet by chance? I know it may not be as pretty but will it taste the same? My iron is very low so they say red beets have more iron. Thank you! Your recipes and writing are fantastic! As a vegan for the last 4 months I’ve really found inspiration on your site- thank you! 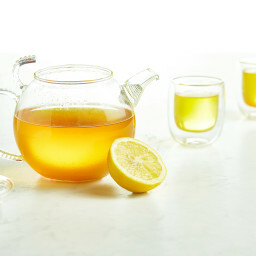 I use my own website http://pinchofflavor.blogspot.com/ to share healthy tips and tasty food ideas as well. Looking forward to your next post! 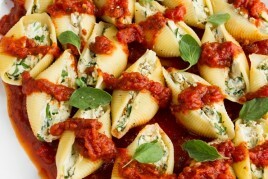 I brought this dish to the potluck I went to this weekend and it was a BIG hit! This will be my go to dish for summer BBQ’s. Thanks!! I made this last night! Turned out really nice :) A few small alterations to share: used purple beets instead as that was all i could find (combined last-minute to prevent too much colour blending) and i included mandarin orange segments as i only had one small navel orange. I also found the dressing too salty for my taste, so i cut it with additional olive oil and apple cider vinegar (could be that my regular soy miso is more salty than your chickpea miso). Oh and i added fennel bulb (sliced and roasted) for extra veg/texture. Highly recommend! Thanks for letting me know! Your tips will be so helpful for others making it. Thank you for the tip about miso, it’s a good point about how they can vary with how salty they are. Re: skin allergy…I had to give up hemp. I developed rashes on my chest and stomach, quit hemp and have had no problems since. Watch out for it in soaps and lotions as well. I made this and it was very good! 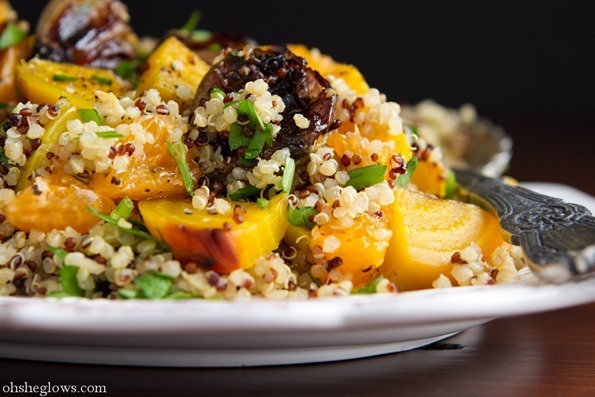 I love a reason to use golden beets! A very good recipe and an interesting combination that I would never have thought of on my own! The shallots were fantastic – don’t skip or skimp! The only change I may make next time is with the dressing. The dressing is very good, but the salad is versatile so could pair well with almost any fruity dressing or vinaigrette. In addition to tasting great, this salad is also excellent leftover. Just made this for dinner last night (although I used red beets since I’ve never seen golden beets in the stores around here). It was really yummy! My first time cooking beets and they turned out perfectly tender. The whole salad turned pink from the beets, but that didn’t matter. The dressing was so good and just a different flavor than what we are used to. Thanks for the recipe! I’m a little short on time the day that I want to make this, so I’m going to use steamed red beets. I think that it will work (?). I just made this last night and it was delicious. Very filling though! One of the very best salads I’ve had. Loved it. I found chickpea miso in the refrigerated “alternative meats” case at Whole Foods. It’s the first time I’ve ever bought miso, and it’s awesome! Hi! I’m in oakville as well and have been looking for chickpea miso for quite some time ! Any ideas where you can buy it around here? hi Victoria, I think Organic Garage has it – have you tried there? Angela, you make being s vegan so easy with your delicious recipes. Where can I buy Miso (other than online). I live in Toronto so I feel like the options are endless, but I’ve tried 3 stores with no luck. Looking to buy rice syrup too. Thanks! Hi Kristina, I buy it at Organic Garage in Oakville. Sometimes it’s hard to find it in stores! Made this last night, the whole family loved it! Only had red beets which turned the whole salad pink when I mixed it, but the kids thought that was fun and it was still so delicious! Added some shaved fennel to top it off. Yum!! Haha, who wouldn’t love a pink salad?! Does this hold up the next day? I was thinking of prepping this the night before for lunch at work. Perhaps just leave the dressing off? Hey Alexis, I love your idea of leaving the dressing off. Quinoa tends to be quite thirsty, so it’s a good idea to add it right before serving, I think! Let me know how it goes.